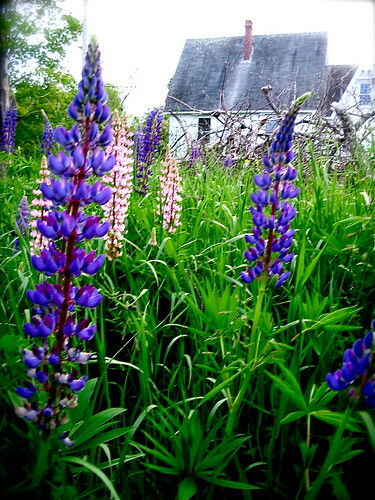 Lupines grow all over the Annapolis Valley, especially along the roadsides. 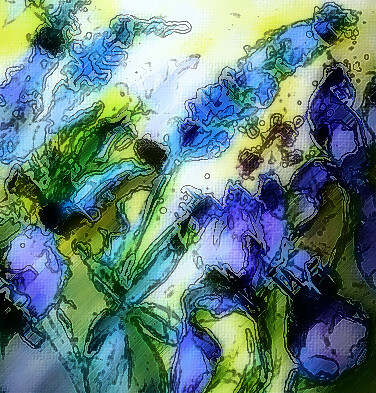 With my shoulders and legs sore from rototilling the garden, I headed for the studio at the end of last week to paint some of the fabulous purple lupines that grow wild around our house. I also wanted to capture the beauty of some masses of Siberian Iris that my friend Pamela gave me from among the hundreds that grow in her flower gardens. My friend Pamela also gave me a clump of Siberian iris for my garden. She is one generous friend! Iris represent to me my late mother and grandmother. They both grew iris and I brought some of their original rhizomes to plant here in Nova Scotia when we moved. I always think of their love of flowers when I see iris and each year for many years I’ve tried to paint their luscious shapes and colours in the short window of opportunity, for they don’t bloom for long. These were my mother's bearded iris and before that, my grandmother's. I brought some to Bear River from our postage-stamp sized front garden in Toronto. I paint them every year. I wanted my painting to reproduce the feeling of being outside (but without the very active black flies) so I pulled out all my vases and water jars at the studio so that I could create a garden on my table! First I worked with watercolour in order to loosen myself up. I also love the way colour and water flow into each other and I wanted to ‘play’ with that. I first painted some shapes with clear water and then loaded my brush with colour and randomly painted some flower shapes so that I would get 'accidental' colour bleeds into the wet spaces. This is one of my favorite iris paintings that I’ve ever done with watercolour. The Ancestor. watercolour by Flora Doehler, 1998. Collection of Gail Waiser. I approached the acrylic like a wet-in-wet watercolour and tried to keep it very loose. I sketched the flowers with watercolour crayons and then spritzed the canvas with water. Next I painted using watery acrylics. When the painting is finished, I'll fix the images by painting a mat or varnish medium over the entire canvas. I’ve been inspired over the last year by reading artists’ blogs and online communities. There is so much creative work and exchange happening out there and it’s exciting to be able to see artwork online and to develop connections and correspondence with fellow artists all over the world, especially because I live in a tiny community that is a great distance from major galleries. I subscribe to artist and writer Carol Wiebe’s blog called Silverspring Studio. I like Carol’s blog because it is a perfect mix of good writing and interesting articles. She writes about her own (beautiful) work as well as other artists. I have been introduced to many creative artists and websites through her descriptions. Carol recently set up her own online community called Cracked Paper Quilts and posted an online tutorial about her use of photo software, Adobe Elements, to digitally alter and enhance her artwork. I was very inspired by the mandela-like images she developed and I tried it myself with the paintings that I’m working on as well as this photo of lupines growing here with our new house as a backdrop. Most of our wild lupines are purple, but we also have some pink and white ones. I altered the colours in the photograph and experimented with some of the filters in Photoshop. To see more detail, click on the image. If only it was this easy to change the wall colours in your house! I photographed a section of the acrylic canvas that I’m working on. I adore the colours. First I altered the image with filters found in Adobe Photoshop. I liked that pen and ink look shown here. First I made the alterations using photoshop. 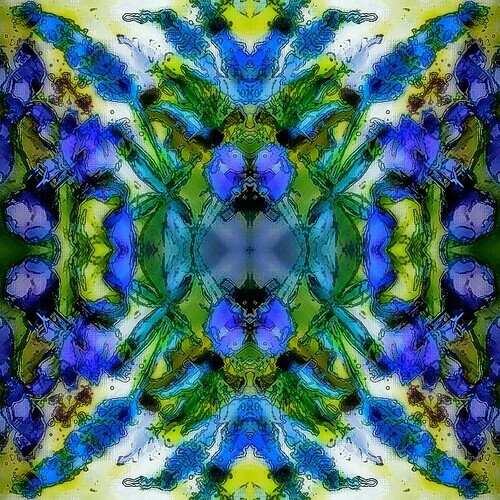 Then I quadrupled the image and flipped and/or turned the image upside down to create the kind of image I might get when looking through a kaleidoscope. Next I quadrupuled the altered image, flipped and turned them and reassembled them. I am thinking of ways to use the resulting works. I get it that altering images can be endless and addictive! It’s fun to see how colour changes can totally alter the feel of a piece. This detail of the iris with watercolour was next on my list. These iris were like having graceful dancers in the studio. I changed the colours and applied a filter in Adobe Photoshop. I love the batik look of this altered painting. I wish I wasn’t so consumed right now with gardening, moving, packing, sawdust vaccuming etc because I just want to paint these gorgeous flowers while they are still in bloom. In another month or less we’ll be moved in and then there will be another wave of blooms to do. Still, I am promising myself to clear the decks for at least 2 weeks next year during iris time. I think this looks like a piece of fabric now. paintings to the max, and was amazed at what you did with Photoshop. I just LOVE those blues and purples Barbara! I’m thinking that the photoshop stuff might make interesting cards. Thanks Apple for your encouragement! Thanks for the commendation: I have been so preoccupied with what’s been happening in my life and studio, that I hadn’t realized you had this 2nd blog! I’ve been enjoying your Bear River blog tremendously, but now Green Willow Studio is in my favorites folder of Google Reader and I have 6 months of your perceptive and artistically informative posts to enjoy! You know the saying about taking time to smell the flowers. I’m taking time to view the Doehlers. Thanks Carol!!! I’m so glad that you inspired me with your work. I set this blog up with the idea of only having art related posts and it’s on my business card too. However, everything that I post here also appears on my Bear RIver Adventure blog because there is such a large readership there. However, posts can get lost there amidst all the others about gardening, rural living etc!! Hi Flora, Found your blog through Barbara’s, who has mentioned you more than once (!). Love your flower paintings! You certainly did manage to keep them loose. Although I also like the photoshop variations, your originals are by far my favortites! Liza, it’s so nice to get to know you. I have been admiring your work for some time now and I especially like your architechture. I lived in Germany for a few years and your paintings evoke the mood for me.